2. Each selects a ROOKIE card from the deck, and places it face down on the DUEL ZONE. 3. Each shuffles the remaining 29 cards, deals himself or herself 10, and places the remaining 19 cards face down ONLINE. 4. Each turns over the Rookie card in the Duel Zone. The players now review the 10 cards in their hand and consider strategy. To increase the amount of Digimon Power you can blast at your opponent, youll probably want to Digivolve to the next level. Proceed to the DIGIVOLVE phase. Tip: Make sure to include enough Power Option cards to give yourself Power Options! Now, you turn over your Rookies. (Fig. 2) Your opponent has played Rookie TENTOMON with Battle Type (RED), and you have played Rookie OTAMAMON with Battle Type (YELLOW). Compare your DIGIMON POWER. 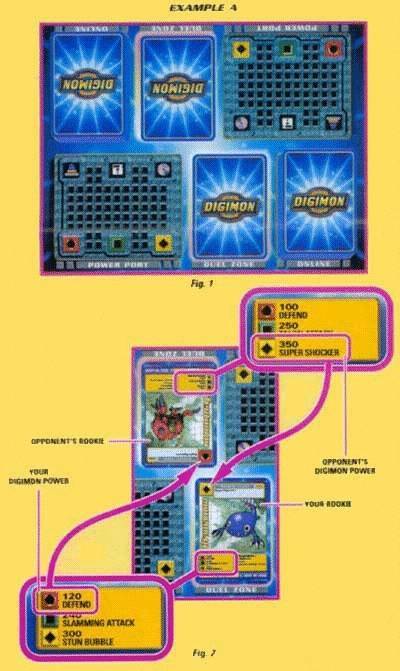 Notice how the amount of Digimon Power is determined by the BATTLE TYPE OF THE OPPONENT. Now you see that your opponent blasts you with Digimon Power of 350, while you respond with Digimon Power of only 120. Your opponent has the advantage!